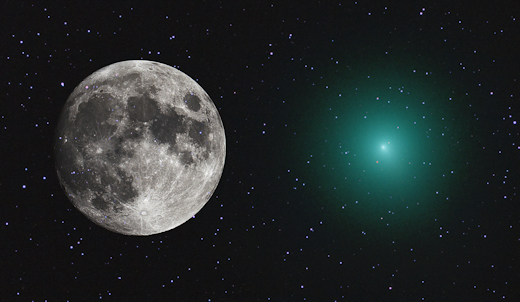 Logically, a full moon size comet wasn’t about to graze Earth. Kudos for making me click, but the key phrase is “proximity makes even a small thing look large”. 46P is a Jupiter-family comet, one of over 400 identified comets with orbital periods less than 20 years, whose farthest point from the Sun is near the orbit of Jupiter. From https://www.space.com/42575-see-comet-64p-wirtanen-earth-flyby-december-2018.html …. Jupiter-family comets will occasionally have their orbits perturbed when they make a close approach to Jupiter because its strong gravitational field can alter — sometimes quite significantly — a comet’s path through space. In the case of 46P/Wirtanen, it underwent two such interactions with Jupiter — in April 1972 and February 1984 — that pushed its orbit about 50 million miles closer to the sun as well as very near to the orbit of Earth. With its current orbital period of 5.4 years, it has been alternating between evening-sky and morning-sky returns. But the evening-sky returns have been getting progressively more favorable. Bottom line – On December 16, 2018 at 8:06 a.m. EST, 46P/Wirtanen will pass 11,586,350 kilometers from Earth, making 46P one of the top ten close approaches since 1950 and top twenty since the 9th century A.D.